Servicios de Control e Inspecciףn, S.A. In the two last decades, automatic ultrasonic inspection has increased its field of application considerably. Thus a technology that was used solely in the inspection of in-service nuclear power stations, at the moment is applied successfully in the inspection of diverse equipment and components in refineries, power stations, aeronautical industry, foundries, constructions onshore and offshore, etc. Between the mentioned applications three significant examples will be analysed in detail. The analysis of results is not made immediately after the inspection. It does not allow the determination of the defect depth. Difficulties in the detection of certain defects like lack of fusion. 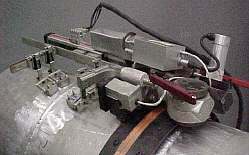 The requirements demanded in this type of constructions have pushed the development of an inspection technique that allows to make the inspection and analysis of results in a short time (approximately 5 minutes in a pipe of 48”). Weld inspection in pressure vessels. The high cost of the automatic ultrasonic inspection did not allow its use apart from the nuclear industry. Today, and due to the cost reduction of the equipment, along with the quality of the results, we are able to use this technique for the inspection of welded joints alone or complementing the radiographic test. Measurement of thicknesses in storage tanks. Some components are subject to periodic measurement of their thickness due to possible losses by erosion-corrosion. In most cases, mainly in great components, the cost of assembling scaffolds surpasses the cost of the inspection. In the example that we are going to analyse, we would show how to make an exhaustive measurement of thickness with no need to mount scaffolds, which means significant savings in the cost of the inspection. 2. PIPESYSCAN: AUTOMATIC ULTRASONIC INSPECTION IN CIRCUNFERENCIAL WELDS IN PIPELINES. The use of radioactive sources. Excessive time consumption and a considerable gap of time between welding and inspection. Trying to increase the performance of inspection in pipeline, S.C.I, S.A., involved in a continuous process of improvement and technological innovation within non- destructive testing, began a research project for the development of automatic ultrasonic inspection techniques applied to welded joints in pipeline. 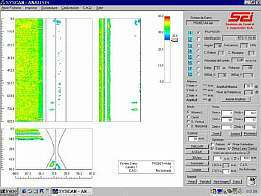 The result of these works is the PipeSyscan system. 2.2 Requirements for the inspection of pipelines. During the construction of the pipeline, the daily production surpasses in many cases 120 joints per day. This means that the time available for the execution of the inspection and the analysis of the results should not go over 5 minutes per joint. It must allow the storage of the results of the inspection in permanent computer register along with all technical data of the inspection, and be available at any moment. The system must be reliable as far as detection, and precision in sizing, of defects, equal or superior to the radiographic test. Due to the variety of thicknesses, diameters and configurations of welds, it must be flexible to adapt itself to each specific case. Pipeline construction is done in difficult places and without energy supplies. Therefore, the system, in addition to being able to move throughout the pipeline, must be autonomous in electrical energy supply and in water supply for ultrasonic coupling. During the welding process an ample variety of defects, like for example, lack of penetration, pores, lack of fusion, etc... can appear. These types of defects should be considered at the time of defining a procedure of inspection by non-destructive testing. In processes where welding is manual, one of the most probable defects is porosity, and as a volumetric defect it can be detected easily by x-rays. With automatic welding, the main defect that can be found is lack of fusion in the interphases between the base material of the pipe and the welding material. These defects are flat, and difficult to detect and evaluate using the radiographic test. On the other hand, as these defects have the same orientation as the edge preparation, is possible to determine the direction of its reflecting surface and thus determine the angle and focal length that must have the ultrasonic beam to obtain the maximum signal response. In order to cover the requirements described in the previous point, a technique of inspection based on dividing the weld profile in different areas has been developed, associating to each of them the possible defects that can appear. Then we choose ultrasonic probes focused in these areas where we expect defects to appear and with a perpendicular angle of incidence to their surface. Thus, using a sensor for each zone, it is possible to make the inspection of the joint in a single turn of the of scanner and to cover the complete volume of the weld. 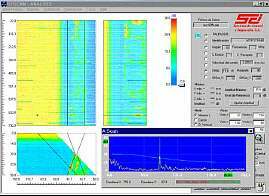 This technique needs, therefore, the use of a high number of probes, requiring a powerful scanner and system of data acquisition, with capacity to store all that information in real time. 2.4 Advantages of the automatic ultrasonic inspection. 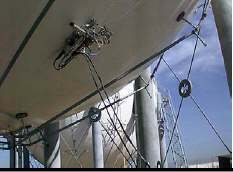 Inspection and analysis of results immediately after the welding process. The automatic ultrasonic inspection can be made approximately 20 minutes after welding and allows to immediately detect any error in the process and to make any convenient corrective action, avoiding later repairs. On the other hand, in the case of the x-ray technique, we do not have any results until, at least, 24 hours after the weld has being finished. High level of repeatability and precision. In addition to the location and sizing in length, its position in depth is obtained. There is no emission of hazardous radiation and consequently, it is not necessary to limit an isolated zone during the test. Chemical products dangerous to the environment are not used, such as those used for developing films. Cost-Effective inspection. Greater reliability than x-ray for the detection of certain types of defect, like for example, lack of fusion. Diameter: 4" up to 60 ". Thickness: 6 up to 30 millimetres. Different configurations and types of welds. 3. 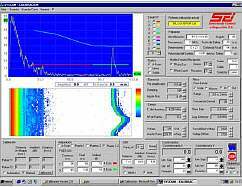 SYSCAN : AUTOMATIC ULTRASONIC SYSTEM. One of the disadvantages of the manual ultrasonic test in relation to other non-destructive testing techniques, is that it requires a operator with great skill and experience for the application of the technique and the interpretation of the results. In addition, it is necessary to consider the disadvantage of not presenting/displaying permanent registry of the results. 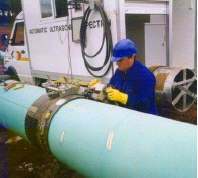 In this sense, SCI after successfully applying automatic tests in the inspection of pipelines, began the development of own systems of automatic inspection of general application. The result of these developments is the Syscan system. This system is made up, on the one hand, of hardware/software that allows to automate all the tasks related to the inspection, from the calibration and planning to the analysis of the results; and, by another one, of mechanics that are sufficiently flexible to be applied on an ample rank of different geometries. The Syscan system, object of this presentation, is an automatic equipment focused to the inspection by ultrasonics of pipes and components, that allow to make a test with the maximum quality assurances, reliability and repeatability. The system has different mechanical equipment, controlled from the system of data acquisition, allowing the inspection of multiple geometric configurations. Thus, it has been designed for the inspection of welds and obtaining maps of erosion-corrosion in pipe, spheres, tanks, etc.. The technique of automatic ultrasonic inspection is similar to the manual test. The difference is that the movement of the probes, the data acquisition and the representation of the results online are controlled by a PC. 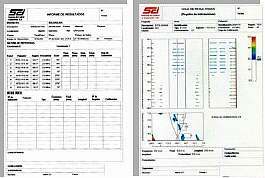 All the information obtained during the inspection can be analysed later by means of graphical tools that facilitate the location, the sizing and the characterisation of indications. The inspection is made simultaneously with several probes with different oriented angles and in different directions with the purpose of completely covering the area of interest. We would now describe the different parts of the system. 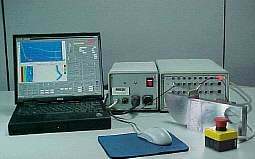 The system of data acquisition is formed by hardware/software and it is in charge of controlling the sequence that sends the electrical signals to excite the active element of the probe and to collect, along with the position of each one of them, the ultrasonic signals reflected in the material. Additionally, it is in charge of representing in real time the data in the screen and stores it in a permanent computer register. The capacity of the basic system is of 8 ultrasonic channels and allows an extension to a maximum of 16. Software is Windows-based, and it is made up of four independent modules: calibration, configuration, acquisition and analysis. Configuration of the type of registry: echo- door or signal. Integrated control of scanner allowing dynamic calibrations. Automatic or manual calibration in distances. It allows to establish the geometric parameters of the piece to examine, profile of weld, and others, like defining the position and direction of the probes. Additionally we establish the general information relative to the inspection, blocks of calibration and other data of interest that later will be included in the results report. During the inspection we can visualize the A-Scan of the selected channel and the representation of the B, C and D Scan of all probes. There are two possibilities of acquisition that can be different for each one of the probes: acquisition of echoes within a door or acquisition of all the signal. The system allows us to modify the parameters of the controller during the inspection. This option is extremely useful at the time of inspecting zones with nonavoidable interferences. Visualization of the B, C and D Scan at the same time. Coloured scale for different amplitudes of signal. Zoom of areas of interest. Visualization of the position and profile of the weld. Visualization of A-Scan for any point swept by the probe. Processing of the Data base of the indications. Cuts in amplitude, route of the sound, correction of comforts in the mechanical equipment. Printing of the results report. Each inspection requires an individual processing, so we have designed different mechanical equipment that allow us to cover an ample variety of geometric configurations. 3.4.1 Equipment for components inspection. Frequently components have limited access and are very difficult to inspect, so the infrastructure necessary to be able to make this inspection is much more expensive that the inspection itself. In order to facilitate this situation we have designed a scanner with magnetic wheels. This equipment has either an automatic control of trajectory (follows a guide) or has a manual control by means of a joystick. The scanner can carry up to eight probes and can be used for weld inspection or to obtain thickness maps. Its main application is the inspection from the outside and inside of tanks, spheres. The flexibility of its articulation allows it to adapt to the different curvature of the pieces. All the parameters of movement, speed, overlap ... are defined by the user by means of software and independently for each axis. 3.4.2 Equipment for pipe inspection. PETROCHEMICALS AND REFINERIES: Inspection of tanks, chemical reactors, spheres, etc. In general, pressure vessels and with the purpose of detecting defects in welds or base materials, or for making maps of thickness losses. POWER PLANTS: inspection in pipelines, retention rings in alternators, boilers, etc..
NUCLEAR POWER PLANTS: Inspection of welds in nozzles, safe-ends, pipes, generators, welds in the reactor head, CRD´s. 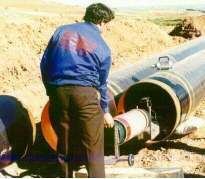 PIPELINES: Inspection of the line, reparations and special points. 4. E-SYSCAN: MEASUREMENT OF THICKNESSES IN STORE TANKS. The tanks for storage of fuels are mainly made of carbon steel, and suffer throughout time losses in thickness due to processes of corrosion that are originated by water or other corrosive elements which are present in the own liquid stored, or by the environmental conditions around the tank. Therefore to avoid fuel losses that imply great lost of money as well as environmental problems of contamination, it is necessary to periodically inspect the wall thickness’, with the purpose of replacing the affected parts during the shutdown processes and overhaul. Due to the great dimensions of these tanks it is impossible to do it manually since we would need to mount a tremendous amount of scaffolds to cover the total surface of the tank, being this much more expensive than the inspection itself. It is here where the use of an automatic equipment becomes necessary. Our system e-Syscan, has been developed from the Syscan and it has been equipped with the same characteristics as far as facility, versatility and graphical presentation of results. It allows the exhaustive measurement of thicknesses with no need to mount scaffolds, making the inspection less expensive. The equipment has magnetic wheels, and makes a linear movement throughout the generatrix of the tank with an ascent and descent trajectory. It carries two probes to assure the measurement of thickness in case any probe losses coupling due to the condition of the surface of the tank. If a loss of thickness is detected, the equipment is able to make a thickness mapping of the area, but this time moving the probes in two different directions so the affected area is delimited. The high speed of inspection is about 8 metres /minute.